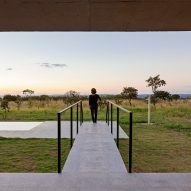 Concrete ribs extend across the brick walls of this house on the outskirts of Brasília, Brazil, which Bloco Arquitetos has designed as two pavilion-like structures linked by an outdoor path. 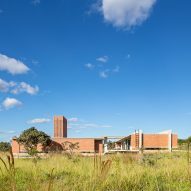 Casa Vila Rica is located 40 kilometres away from the centre of the Brazilian capital city on a gentle slope overlooking a valley filled with native vegetation. 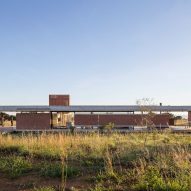 Bloco Arquitetos designed the house in response to the local climate, which includes a dry season and a period of rainfall that typically lasts for four to five months. 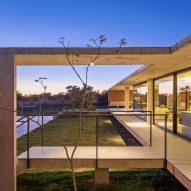 The residence is raised above the ground on a concrete platform to prevent large insects and wild animals like snakes from entering the house. 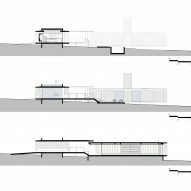 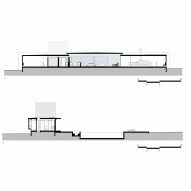 The house is divided into two perpendicular wings, which are elevated to different heights to accommodate the changing level of the site. 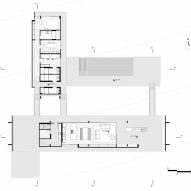 One of the wings is occupied by the lounge, kitchen and dining room, while the other hosts the bedrooms. 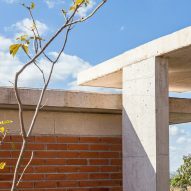 Steps and walkways that link the two are placed on the exterior so the residents can make the most of the warm climate, but shelter is provided by the eaves of the flat concrete roofs. 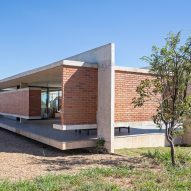 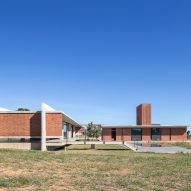 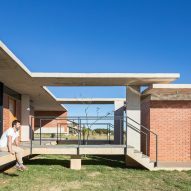 Solid brick walls are slotted between the concrete structure, echoing the material palette the architects used for a house extension for a family in Brasília. 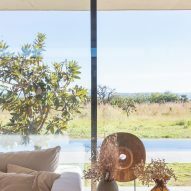 The architects left the materials exposed to reflect the building techniques of the local area, and to save time on extra finishes. 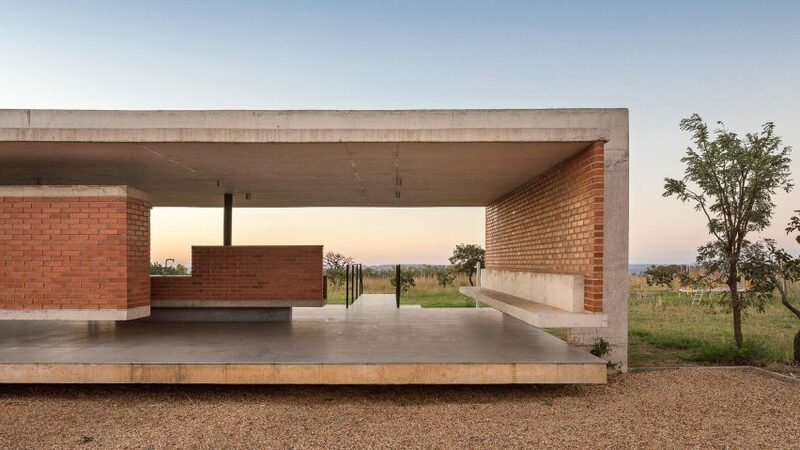 "We have decided to use the expression of the materials in its raw state, accepting the imperfections of the local manual labour and its limitations," the architects explained. 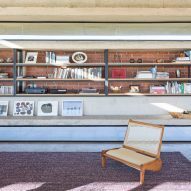 "The idea was to minimise the extensive labour that is normally used for the finishings such as plaster or paint and to have materials that would age well without the need for constant maintenance." 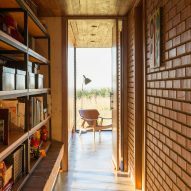 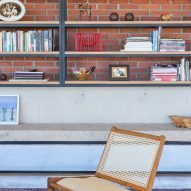 The materials also form other features of the residence, including a concrete bookshelf in the lounge and the brick hearth and log store of the outdoor fire place. 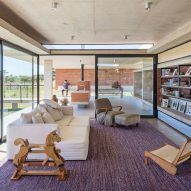 Large expanses of glazing make up walls in the living areas to offer views to the gravelled courtyard and the swimming pool outside. 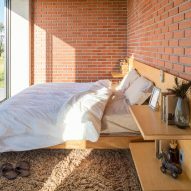 Clerestory windows are slotted into the walls of more private spaces like bedrooms, while bathrooms feature open-air voids that bring natural light and ventilation. 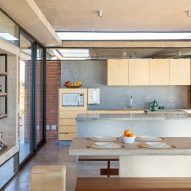 Inside, the architects selected a simple material palette, including exposed concrete flooring. 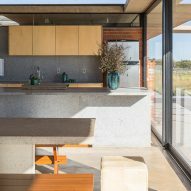 Other details include the dining table, which is made of concrete, and the stone kitchen counter and wooden kitchen cabinets. 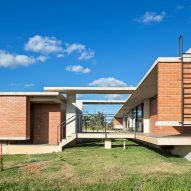 Bloco Arquitetos designed another house in the city inspired by the principles of modernist architect Adolf Loos. 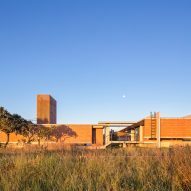 Photography is by Haruo Mikami.